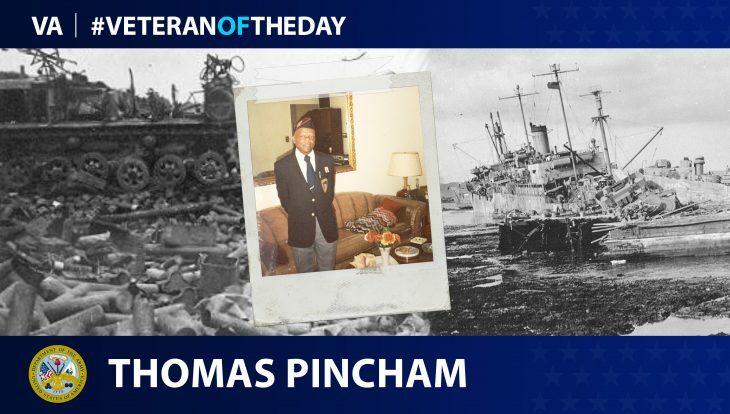 Today’s #VeteranOfTheDay is Army Veteran Thomas A. Pincham. Thomas served during World War II. New York City native Thomas Pincham was drafted into the United States Army in March 1944. After receiving basic training at Camp Upton, New York, Thomas was assigned to the 865th Port Company. From Camp Upton, Thomas was assigned to Fort Indiantown Gap, Pennsylvania, where he was trained in taking cargo ship inventory. After completing his training, Thomas was assigned to Charleston, South Carolina before being sent to Seattle, Washington in preparation for the invasion of Okinawa. Thomas arrived on Okinawa after the main invasion and served there as a cook. From Okinawa, James was sent back to the United States and discharged on May 20, 1946 at the rank of private first class. He then returned to his home in New York and began working as a toll collector with the Triborough Bridge and Tunnel Authority. During his military service, Thomas gained a passion for traveling and continued to do so throughout his life. After retiring in 1988, Thomas moved to Palm Coast, Florida, where he remained until his passing in 2012 at the age of 86.